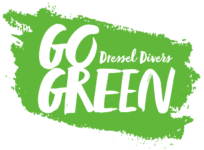 Dressel Divers’ environmental project, Go Green, wants to celebrate its first anniversary with you with a big prize draw. Register now for a chance to win 1 of 10 scuba dives or local snorkel trips. 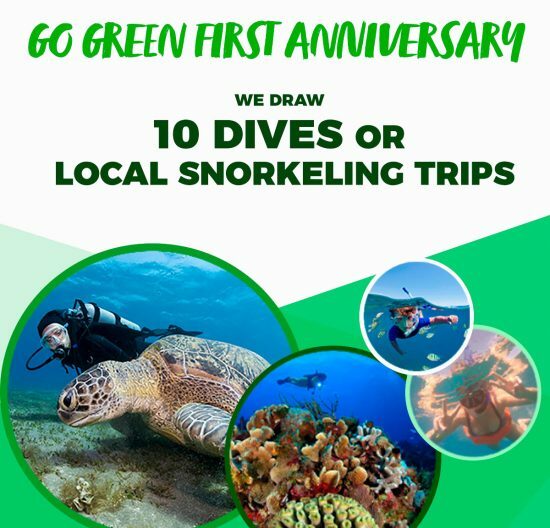 Internet users all over the world will be able to take part in the Go Green First Anniversary promotion, with the exception of Garchitorena SL and Dressel Divers employees, franchisees and partners. The promotion will start on Wednesday the 3rd of April, 2019 at 17:00 hours (Spanish time UTC+1) and it will end on Wednesdays the 17th of April, 2019 at 12:00 hours (Spanish time UTC +1) After that time, the participation will no longer be possible. On Wednesday the 3rd of April, 2019 at 17:00 hours an internet landing page will be posted on the Go Green web site page https://www.dresseldivers.com/blog/go-green-first-anniversary-contest/. In order to take part on this contest, the participants will have to properly complete every field of the form and submit the form. Only one participation per person is allowed. The draw will take place on Wednesdays the 17th of April, 2019 at 12:00 hours approx. (Spanish time UTC +1) and the winners will be chosen by http://www.randorium.com . The algorithm of this application generates random numbers which will designate the winners of the promo. If some of the winners do not meet the requirements imposed by these rules, they reject their prize or, Go Green is not able to contact them due to reasons beyond its control, the prize will be declared void. After this happens, this process will not be repeated anymore. Go Green will post the he results of the draw on its web site page: https://www.dresseldivers.com/blog/go-green-first-anniversary-contest/ and on the Dressel Divers Facebook fan page https://www.facebook.com/DresselDivers and, will be encouraged the winning participant to contact the organization through email. Go Green is allowed to publicly post the winner’s name on Facebook. If a week after this happens, the winner does not contact with Go Green, the organization will understand the prize has been rejected and it will be declared void. Neither Facebook, Instagram, Twitter or any other Social network where the contest will be posted, sponsor, support, or manage any Go Green promotion, neither is Go Green associated to any of them. There will be 10 winners. Every winner will be able to choose a dive or local snorkel trip voucher. The vouchers will be used only for the service chosen and will be valid for 1 year. The winners should provide Dressel Divers/ Go Green with their data within 1 week after the draw, in order to receive the prizes. The 10 dives or local snorkel trips are only valid for the services offered at our dive centers (except Puerto Vallarta, Puerto Plata and Majorca). Flights, transfers, stays or any other additional costs, dive gear rental or local fees, are not included in the prize. Offensive comments, insults, threats, rude language, degrading content or disqualifications towards others user, Go Green, Dressel Divers, our staff, products and/ or services on any Social Media in which the contest be posted are inadmissible and they will be deleted. Likewise, spam comments will be removed. Dressel Divers reserves the right to take additional legal measures with any user who defrauds, alters or blocks the proper functioning of this promotion. Taking part in this promotion involves the acceptance of these terms and conditions.